I first started taking pictures when my three children started running at an early age. As members of Menai track and Field, they turned out on a regular basis to compete for their club. As a proud father, I started taking pictures with a (now dated) Kodak digital camera, and I thought to myself, "While I'm here, I might as well taking pictures of everyone else!". Soon enough, I started to share my pictures with everyone else, and if people wanted a copy, I used to send them on, free of charge. 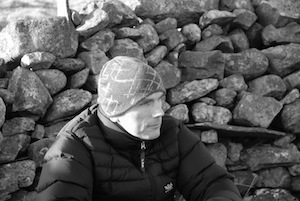 I then met Alastair Tye of Fell Running Pictures. He helped me by posting links of my pictures on his website. Soon enough, he was also helping me set up my own website. And so it moved on, I was attending more and more races, not only running events, but cycling, triathlons and swimming. I then decided to establish my own photographic company, SportpicturesCymru. With the help of Menter Mon, I received a grant to buy some new equipment, and attended courses on accounting and e commerce.